Does your horse have a sun bleached coat? Has it lightened in areas where he sweats? Would you like to enhance your horse’s natural colour? n an area that cannot really be seen and there is a small tester on the side of each kit. Show pony is available in a great range of colours to suit most horses, they include Black, Brown, Chestnut and clear. Firstly, mix the bottle of powder with 50ml of water then apply to most sensitive area of the horse where it is not noticeable (i.e. under the belly area), cover a s much of this area as possible, leave for 48 hours then rinse thoroughly. If irritation occurs please do not continue using Show Pony colourants on your animal. Remember, there is a greater chance of you having a reaction to this product than your horse, so always wear gloves when handling the product. 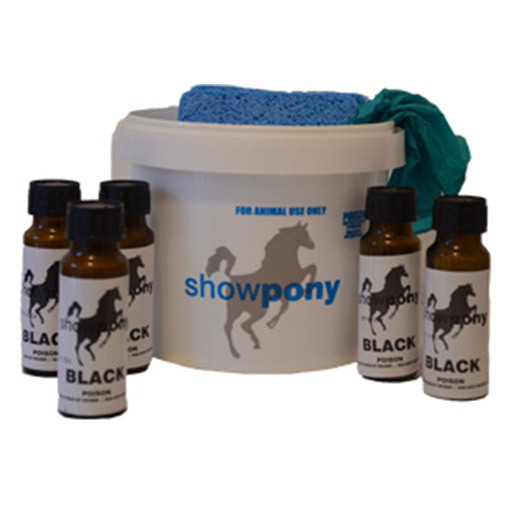 In each kit of show pony you will find 5 containers of dye, gloves, application sponges and instructions. Please read the instructions carefully before you apply any of the colour. Each of the containers of dye must be mixed with 500ml of water to mix into the smooth paste that will be applied on your horse. The separate containers will help you manage the amount of dye you use more effectively. Smaller areas, like a tail may only need one container of dye. Step 1 - To make one container of dye, simply add the powder to 500ml of water in the bucket, seal the lid firmly and shake until all powder has dissolved. When all powder is dissolved, start applying colour immediately using the sponge provided, starting where the horse is palest and avoiding the eye area and areas you do not wish to be coloured. If you wish to conceal a very pale area you may need to cover this area twice. Work the dye into the coat using circular motions to avoid streaks and lines in the finished result. Step 2 - After applying to pale areas, work the colour through the rest of the horse with the sponge, being quite generous with colour and massaging thoroughly. Once the horse is fully covered, leave the colour on for fifty minutes. A crust of colour may form, which is normal, so please do not rinse off until fifty minutes has elapsed. Step 3 - After fifty minutes, rinse horse thoroughly with warm water. Then generously apply and lather a rinse shampoo, and remove once again with water. Apply a conditioning crème if required and rinse again, making sure all products are removed from the animal. I recommend using the Judges Choice Brilliant Shine shampoo to remove the dye after 50 minutes. Judges Choice Brilliant contains Coconut Oil, Argan Oil, Almond Oil and Pro Vitamin B5 so it is the perfect moisturising shampoo to lock in the colour. HSE Hot Oil is also really good to use after applying Show Pony colour to lock in that colour and moisturise the coat ensuring that healthy shine. HSE Hot Oil can be applied straight after the dye has been thoroughly washed off or you can continue to use a part of your healthy coat regime. Please note - Instructions have been taken straight from Show Pony.